Beautiful, newly-restored house on two levels overlooking the stunning, crystal-blue Adriatic sea, the majestic Maiella mountain range and the breathtaking Gran Sasso (central Italy’s tallest mountain). Enjoy your morning coffee with a view from one of the two terraces or from the balcony off the master bedroom. Located in the historical city-center of Silvi Paese, this home offers everything the discerning guest could be looking for. Looking to relax? The house is only 3 kms from the endless white sand beaches lining the Adriatic. Lay among the old-growth pines and palms and soak up the sun or go for a dip in the sea. Looking for culture? Just a short drive up the hills is Atri, a gorgeously preserved town dating from Roman times. Or wander the cobblestone lined streets of Silvi itself. Looking for shopping? Silvi Paese is located just 15 kms from Pescara, a major city, home to several shops carrying all the latest Italian designs. Travel by bus, train, or take your own car. Looking for adventure? A short 20 minute drive takes you up into the foothills of the Maiella or Gran Sasso mountain range where endless hiking trails take you through historical towns and natural, rolling pastures. Don’t forget to stop and say hi to the shepherds as they tend to their sheep! Looking for great food and wine? It’s everywhere you go! The house is located in the heart of Silvi Paese, which is situated on an escarpment (about 300m above sea level) overlooking the Adriatic sea. It is close to all amenities, including quaint restaurants, bars, grocery stores, a bakery and gelateria - all family-owned and inviting. Larger grocery stores and additional restaurants and bars are a short drive away in Silvi Marina. Silvi Paese is located 2 hours (175km) east of Rome on one of Italy’s greatest highways with scenic views and minimal traffic. Silvi Paese is easily accessed by train, bus or car. The closest airport is Abruzzo International Airport, in Pescara. The location in Silvi Paese / Centro Storico was perfect for us. Local restaurants, cafes, gelateria all within a few hundred meters and a very silent place. The apartment very nice and with all equipment needed. The views from the terraces was fantastic. Excellent beach reachable within few minutes by car. In addition we enjoyed the town festival with lot of local entertainment every evening. We stayed in the apartment for nearly 3 weeks and every day was a pleasure. The views are truly stunning. I never got tired of sitting on the patio looking out over the Adriatic. The place was on of the best equipped we have ever stayed in and we have used Home Away quite a bit. We found a couple of very nice restaurants within a couple hundred yards from our door. Silvi Alta was one of the most charming little towns we have stayed in Italy. The piazza of the town was just below the balcony of our bedroom. We had several guests (Italian friends and family) join us for short stays. The beach and beach action is a short ride down the hill. It was great being in a quiet somewhat out of the way spot. We had so much fun with my wife's stepfather's family, that there was little time for sightseeing on our own. No matter, we were having too much fun with other activities (mostly eating and socializing). If you are looking for an out of the way spot that has the feel and texture of the real Italy, this place is for you. If you are looking to be close to the sea and in a beautiful historic town, this is the rental for you. The property is as described with two nice bedrooms and a pull out sofa by the terrace. It is cool enough that you do not need air conditioning and the terrace overlooking the ocean is stunning! The town also has beautiful views and a handful of stores. It is very charming. You need a car or you can take the bus down to the sea. We tried many beaches along the seafront including Pineto, Silvi Marina and Monte Silvano. The beaches in Pineto are along a pine forest. Montesilvano has the large rocks which you can swim out to. All of the towns have restaurants and beach clubs on the sea as well as public areas. There is a large mall about 7 minutes from the house. If you are looking for a pool, the hotel Casa Nostra will allow you to swim there for 7 euros per person for half a day. They have a beautiful vista and pool. The owners are very helpful and respond to all questions. The local agents also are very nice and live very close. The kitchen is well equipped but does not have a dishwasher or microwave. In the beginning we had 6 people in the apartment which I would say is a little small. Four would be ideal. There are some excellent restaurants right in town so you can walk to them as well as a bar and gelateria right under the apartment. It took us about 7 minutes to drive down to Silvi Marina and about 10 to get to a beach which we did almost every day. Amazing hikes in the Gran Sasso mountains and beautiful towns and festivals all within about 20 minutes. Would highly recommend! Silvi Paese is absolutely wonderful! The view from the terrace of this home is magnificent and you can see the whole Adriatic coast. This villa is newly redecorated and very comfortable. The stroll in the village is relaxing and there are four great restaurants just a few minutes from the Villetta-even a Ristorante del Buon Ricordo-Ristorante Vecchia Silvi! 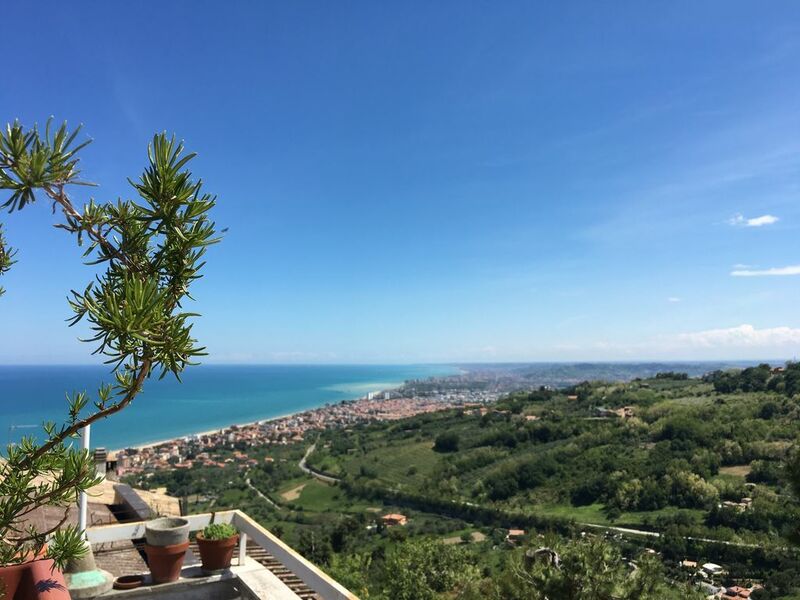 We loved our stay and have recommended Villetta Susana and Silvi to our friends for a wonderful Italian getaway. Five of us stayed in the villa and had a fabulous time. The pictures can't capture the unbelievable view from the 2 rooftop terrraces. Although We had some really great meals in the town We loved just sitting on the terrace in the evenings with local foods and wine from the market down the street. Everyone in the town was so nice even though We don't speak Italian well and not too many people spoke English, it was never a problem. It made us feel like We were really in Italy living like Italians and not just visitng tourist attractions. My husband's family was from a nearby town and the caretaker of the villa, Lorenzo, drove us to the town and did some interpreting. Lorenzo and his wife were such nice people and their help made the trip just perfect. The beach is just a few minutes away and is beautiful. You can't go wrong spending some of your vacation at the Villa, and is a great combination with spending time in Rome which is only 2 hours away. Nightly or monthly rates are also available, please contact us for details. We also accept payment in Euros or Canadian dollars equivalent.